One of the most unique places in the world, Manuels River boasts a fascinating history that goes back millions and millions of years. 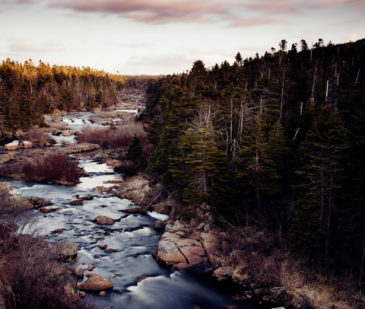 Manuels River has a rich and compelling geological history. The rocks upstream from the Manuels River Hibernia Interpretation Centre, on Canyon Trail, are igneous in origin and derived from the cooling of molten rock approximately 650 million years ago. Directly behind the Interpretation Centre, there is a large slab of granite, which formed deep under the Earth’s surface 580 million years ago. The rocks downstream from the Manuels River bridge, on the Ocean Trail, are sedimentary, so formed in association with water. Immediately past the bridge, the beach that surrounded the Manuels River volcano is preserved as a large sheet of rock called a conglomerate. If you stand on this large slab of beige rock, you can easily see the 540 million-year-old beach rocks contained within. Further down the Ocean Trail, the rocks on the river are formed from mud which accumulated on the sea floor approximately 500 million years ago. These layers of mud have compressed over time to form thin sheets of dark stone called shale. These black and grey shales are very soft and have eroded away by water activity over the past 10,000 years to form a deep river valley downstream. There are two fossil localities on Manuels River, one on Ocean Trail East and one on Ocean Trail West. 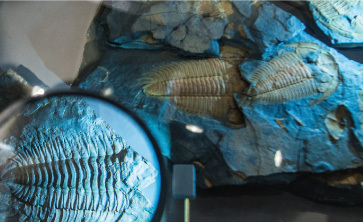 Both are host to a diverse array of well-preserved fossil organisms, including brachiopods, hyoliths, mollusks and — most importantly — trilobites. These trilobites possessed an external shell, much like the crabs and lobsters of today. These ancient trilobites would have regularly shed their shells to produce larger ones; one of the reasons why we have so many amazing fossils preserved at Manuels River.